OK, we did a little dance at our Christmas concert on Sunday. It was to two South African songs and (hopefully!) matched the energy and spirit of the song. Not everyone danced, just six brave souls (and me – since I’d choreographed the thing I had to dance at the front to make sure everyone was getting it right!) in front of the rest. Oh yes, and we swayed (in unison of course) to our New Zealand Maori song. So not a lot of movement, nothing much to look at really, and certainly none of that naff choir ‘choreography’ where everyone looks awkward and never really get the simple movements right. I’m certainly not advocating that. I’m not suggesting that choirs find ways of jazzing up the fairly traditional “standing in rows to sing one song after the other”. What I am suggesting is perhaps a new context or a new form within which songs can flourish and entertain (without distracting from the music). Ah! Distractions he says. Which brings me another bugbear of mine. I really do think people want something to look at in a concert as well as simply listening. Most people seem to welcome some kind of distraction from looking at row upon row of identically dressed choristers. And some people just get bored! This is where the programme comes in. 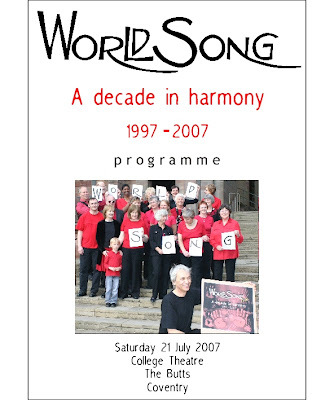 Sometimes when we’ve done a significant gig (choir anniversary, charity event) or played a posh or ‘proper’ (you know, the ones where they do ‘real’ music and everyone is formal, dressed up and well-behaved) the issue of programmes comes up. I don’t like programmes at concerts. In my view it stops people from listening to the singing. I guess it’s OK if you’re doing a classical piece which lasts 30 minutes, but if you do short songs like we do (our Christmas concert had 31 songs in it this year), then the song’s over before anyone’s read about it in the programme!. There will be shuffling, digging in bags for spectacles, craning necks and extending arms to throw a bit of light on the programme so it can be read, etc. etc. All very distracting for us singers on stage, and totally distracting for the audience member. I always give lengthy and detailed background (delivered, I hope, in a light-hearted and witty manner) to each of the songs that we do. Then people can focus on the song itself when we sing it. If they need to take the information home with them, then they can buy a CD (with extensive information booklet). Alternatively, we could sell programmes after the concert has finished. A little souvenir of the evening to take home. Because of our repertoire and style of singing, there is seldom mention of composers, never mention of soloists (there aren’t any) and no mention of instrumentalists (we don’t have any). What people get in our programmes (the rare times that we do produce them) is a little piece about the choir and information about each of the songs we’ve sung. Maybe we should put a few pictures in too so people have even more to look at and entertain them whilst we’re singing!